Each August in the city of Yokkaichi in Mie prefecture, a giant mechanical effigy of Onyudo, a legendary Japanese monster, is paraded through the streets during the Grand Yokkaichi Festival. 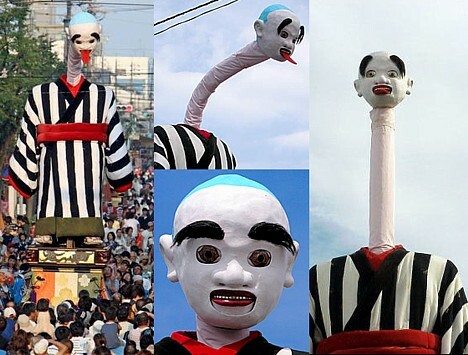 The mechanized puppet, said to be the largest karakuri ningyo in Japan, stands between 6.3 and 9 meters (20 to 30 feet) tall depending on how far its neck is extended. The giant Onyudo wows spectators by swinging its arms, bobbing its head around on its long neck, moving its eyes and mouth, and sticking out its tongue as it is wheeled through the streets to the accompaniment of taiko drums. 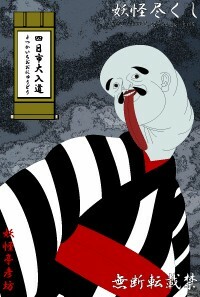 Onyudo, whose name literally means "large monk," appears in a number of folk tales across Japan. While his physical appearance and characteristics vary from story to story, he is always large, ranging anywhere from 2 meters (6 ft. 6 in.) tall to as large as a mountain. Onyudo usually appears as a giant person or an indistinct shadow, though he is known to have the ability to shape-shift. In most cases, Onyudo is a malevolent figure that can cause people to fall ill simply by looking at them. Some stories identify him as being a fox or tanuki (raccoon dog) that has shape-shifted (a common ability for these animals in Japanese folklore), but in most stories, his true identity remains a mystery. The Japanese Wikipedia entry for Onyudo (大入道) includes a nice selection of stories from different areas and time periods. Here are a few. In Hokkaido during the Kaei period (c. 1850), native Ainu communities reported seeing Onyudo near Lake Shikotsu and Mt. Fuppushidake. It is said that he could drive people to madness and cause them to lose consciousness just by looking at them with his large eyeballs. In Toyama prefecture, people with medical conditions staying at the Kanetsuri hot springs to cure their diseases claim to have seen a 15- to 18-meter (50 to 60 feet) tall Onyudo, who was described as being surrounded by a beautiful rainbow-colored halo. In 1937 near Akabane station in Tokyo, a military officer delivering an akagami (draft card) had a frightening encounter with Onyudo at a railroad crossing near Akabane-Hachiman Shrine. Here, Onyudo appeared as a soldier. Four days later, the officer was hit by a train at the same railroad crossing. While stories rarely identify Onyudo as a human spirit, this story suggests the Onyudo was the vengeful ghost of either a new recruit that had committed suicide or a soldier that had been accused of failure and bludgeoned to death by a superior officer. In some cases, Onyudo is helpful. For instance, according to an old story in the town of Ishii in the Myozai district of Tokushima prefecture, an 8.5-meter (28 feet) tall Onyudo would show up to help mill the rice whenever it accumulated at the local water mill. However, the Onyudo only worked alone, and if anyone tried to observe him while he worked, he would turn angry and frighten them away. Yokkaichi's Onyudo also appears to have been rather friendly, according to this website. One day long ago when Yokkaichi was a little merchant town, a large young man appeared at a small local shop and asked the owner to hire him. The shop owner, named Kyuroku, politely refused to employ the large man because the shop was too cramped to accommodate him. But the young man insisted, explaining to Kyuroku that he had just arrived from the countryside in search of work. Kyuroku eventually decided to hire him and gave him a room in his house behind the shop. Mysteriously, the business began to thrive. Things went so well that after three years, Kyuroku asked the young man to marry his daughter so that he could one day inherit the shop. The young man refused the offer, saying he only wished to continue working as he had been. Late one night the next summer, Kyuroku woke from his sleep and decided to step outside for some cool air. As he walked past the young man's room, he noticed the glow of an oil lantern inside, visible through the shoji screen. The light cast a large shadow on the shoji that stopped Kyuroku dead in his tracks. He saw the ghastly, dark shape of a head attached to a long sinuous neck, slowly twisting and turning back and forth. Kyuroku watched in horror as the shadow snaked its head to the lantern and began to lick the oil. The head at the end of that horrible neck clearly belonged to the young man. Kyuroku passed out from fear and fell to the floor. After waking the next morning, he cautiously went to the young man's room and peeked inside. The room was empty except for the man's striped kimono, which lay neatly folded on the floor. He had disappeared without a trace. Nobody knows what happened to the large mysterious man, but the town of Yokkaichi built the mechanical Onyudo effigy to pay him their respects and wish for his safety.